Every now and then I remember that I like to take part in weekly posts and see what other bloggers are up to. This week I remembered ‘Our Creative Spaces’. I’ll try and remember it more often! 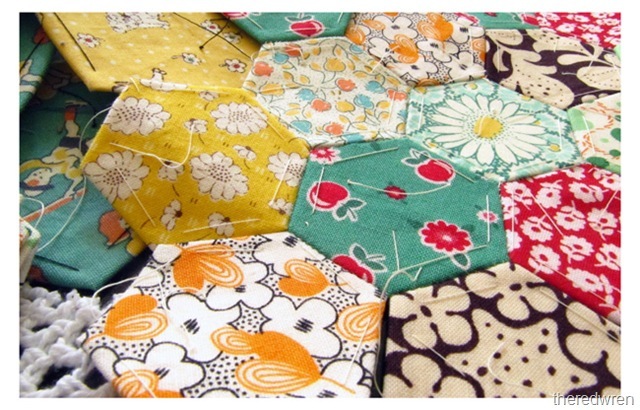 This week I’m making hexagons and pentagons for two projects. I hope to have the projects finished soon as Elijah loves to throw the hexagons around and chew on them. Looks good! One of these days I am going to try hexies! Have fun with them! I love hexies, they are so addictive aren’t they. Love your fabric combos!